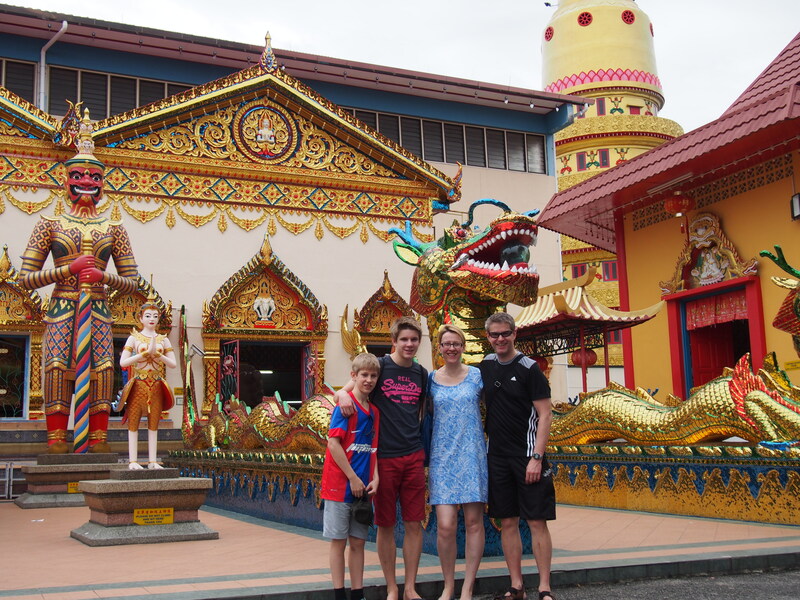 Travelling is a passion I share with my family. My husband and I started planning a big trip almost as soon as we met. Our sons, 16 and 12, have seen a lot of the world with us. Our horizons have broadened along with our awareness of how fortunate we are in so many ways. We decided to celebrate our 20th wedding anniversary in December with a family trip somewhere completely different. We considered Vietnam but the weather would have been too wintry in the north so our focus shifted to Malaysia, which some of our friends had raved about. Normally I organise everything myself to keep a lid on the costs but not being very familiar with the region, this time we booked with a tour operator, Selective Asia, and slightly customised their West Coast itinerary. I have nothing to gain by saying what a great company they are but it’s certainly true – all the arrangements worked perfectly. 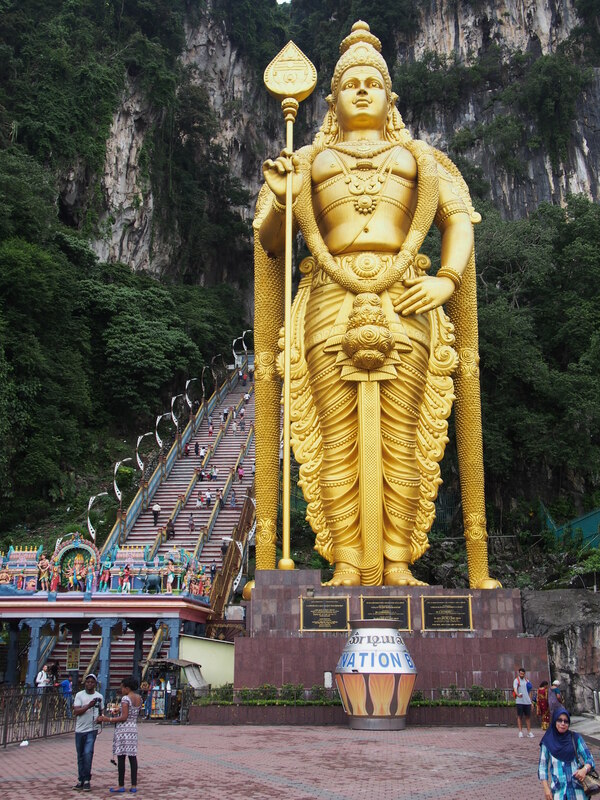 Malaysia turned out to be an ideal first proper taste of Southeast Asia – it’s safe, with a good infrastructure and feels quite westernised despite having its own very rich blend of cultures and influences which are very apparent in its history, languages, cuisines. Due to its prime location on shipping routes and natural resources (rubber and tin amongst others), peninsular Malaysia has always attracted foreign interest going back centuries: from India, China, the Portuguese, the Dutch and the British, who colonised ‘Malaya’ until shortly before it gained independence as Malaysia in 1963. The events of the 20th century alone are fascinating but too complicated to go into! 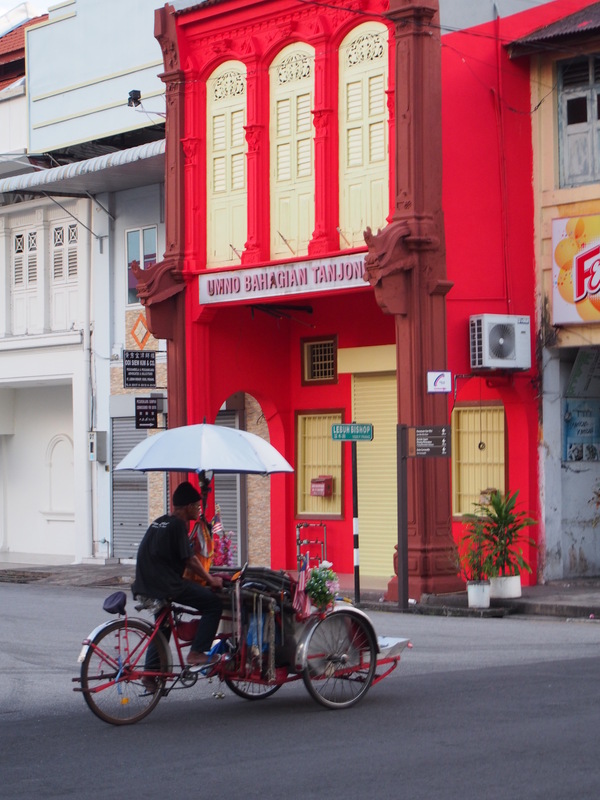 Our first stop was the historic port of Melaka, two hours south of the capital, Kuala Lumpur, going towards Singapore. This was the most European-influenced place we visited and in fact the first place our guide took us was an Anglican church with a fountain dedicated to Queen Victoria in the square outside. We discovered Nonya cuisine, a fusion of Malay and Chinese cooking which arose from the assimilation of those two ethnic groups. 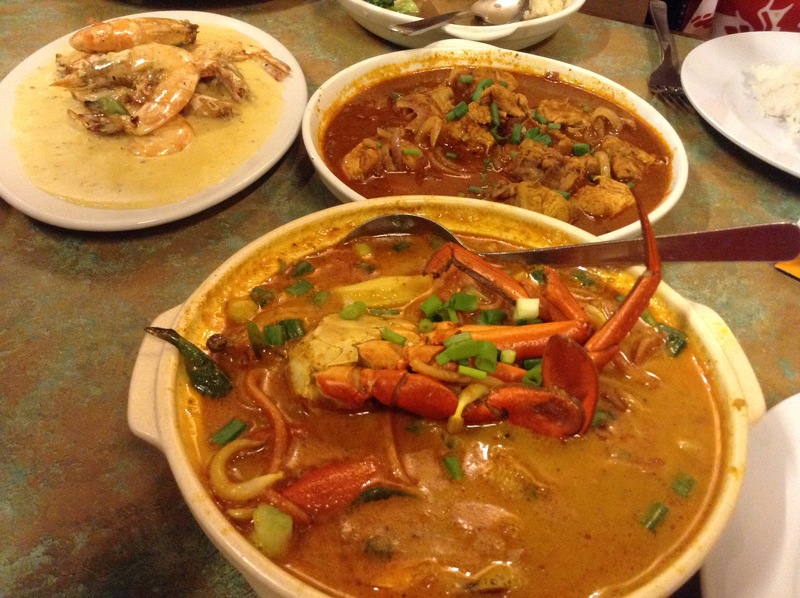 It is big here and in Penang and unbelievably delicious, but then the food in Malaysia is out of this world generally, especially if you like spicy dishes and seafood, and it’s really cheap. With Malay, Chinese, Nonya, Thai, Indian, Indonesian on offer even on breakfast buffets, we have never been to a more exciting food destination! 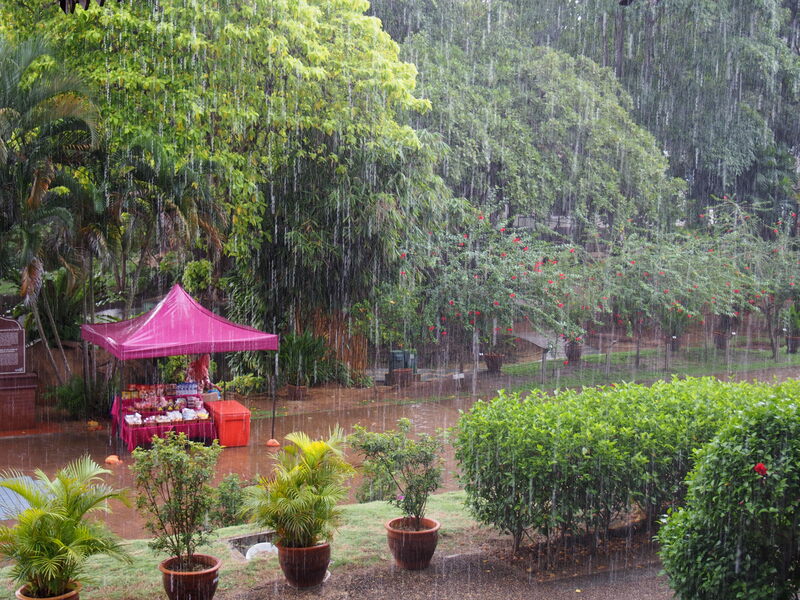 It was also in Melaka that we got the first of many drenchings. 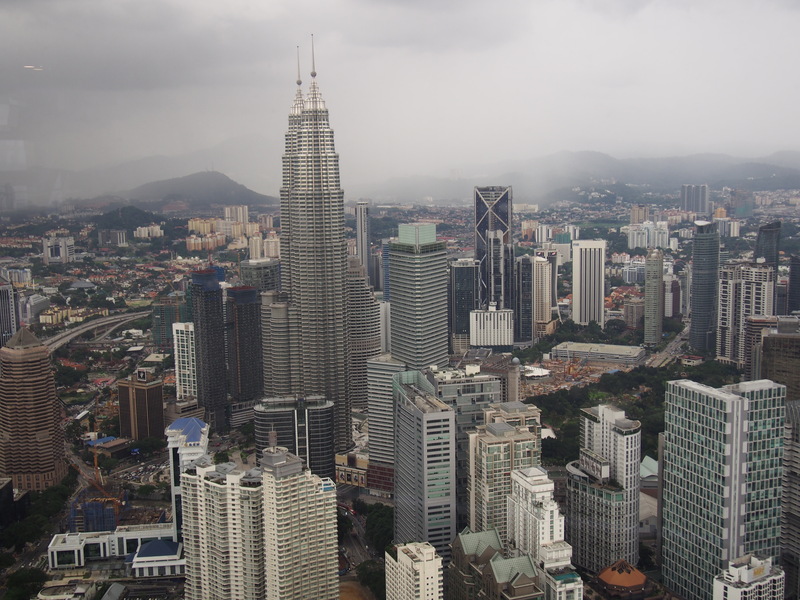 You may have seen the terrible floods in Malaysia on the news – we were lucky not to be affected but there was considerably more rain than ‘normal’ even for the monsoon season and although very hot and muggy, we didn’t see too much sun or blue sky. 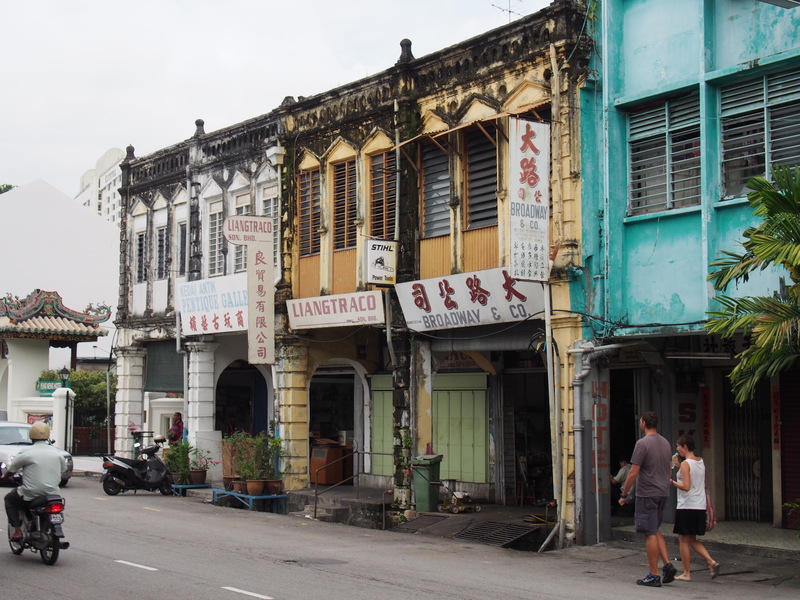 Walking around Malaysian towns is an ‘interesting’ business with few pavements or places to cross the road and deep open monsoon drains – you need to watch your step and I was glad we didn’t have young children in tow. 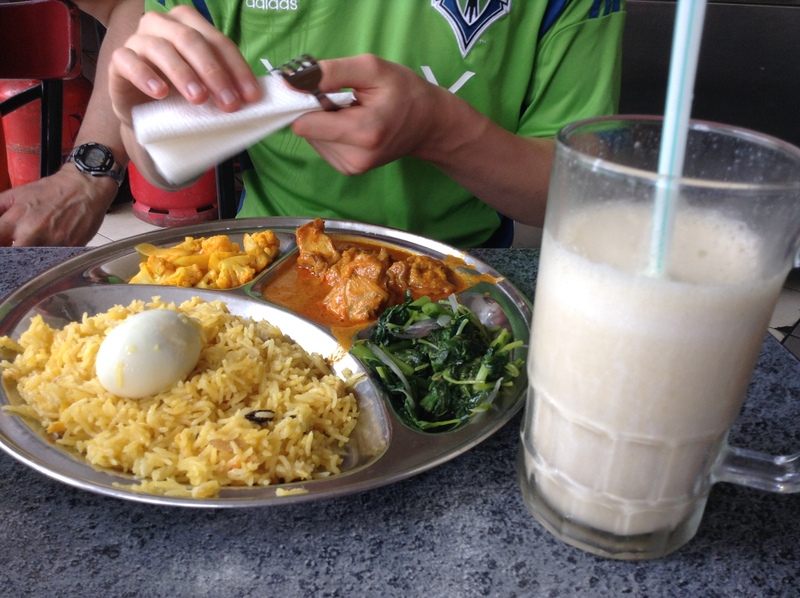 We went on to Kuala Lumpur for a couple of days, which was OK but without being too undiplomatic, not really our kind of place. It was fun going up the Menara KL Tower, from where we had a great view of the sprawling city including the famous Petronas Twin Towers (though from an angle where you can’t see the further one very well) just before everything disappeared into thick cloud. Our guide the following day did a great job of bringing some of the older districts to life, showing us food markets and hidden corners we would probably have missed amid the endless traffic and shopping malls. 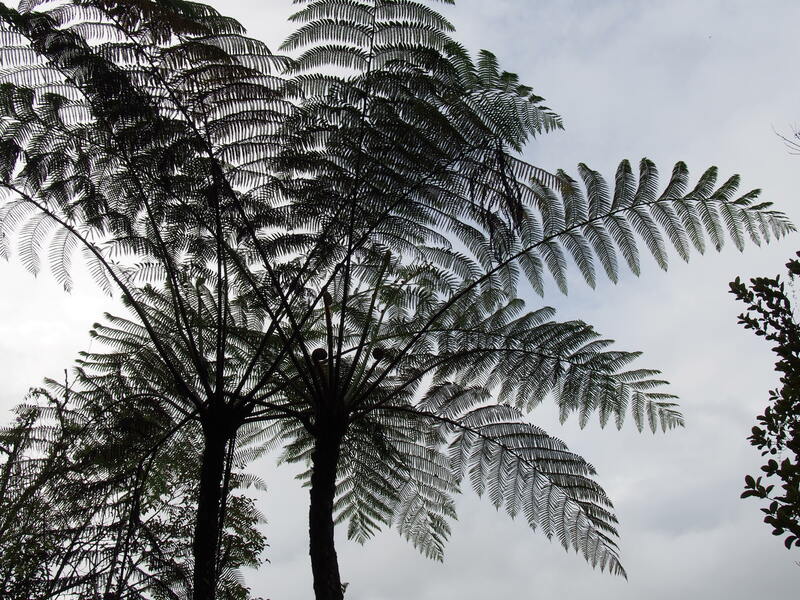 By this time we had just about shaken the jetlag and were keen to get out into nature in the Cameron Highlands, about five hours to the north. We were driven from place to place in air-conditioned mini-buses, apparently a popular choice as there are masses of them on the roads. It’s not an exaggeration to say that my interest in Malaysia and this area especially was inspired by reading The Garden of Evening Mists by Tan Twan Eng, which is set here*. Although it was much colder and wetter than expected, we were not disappointed. 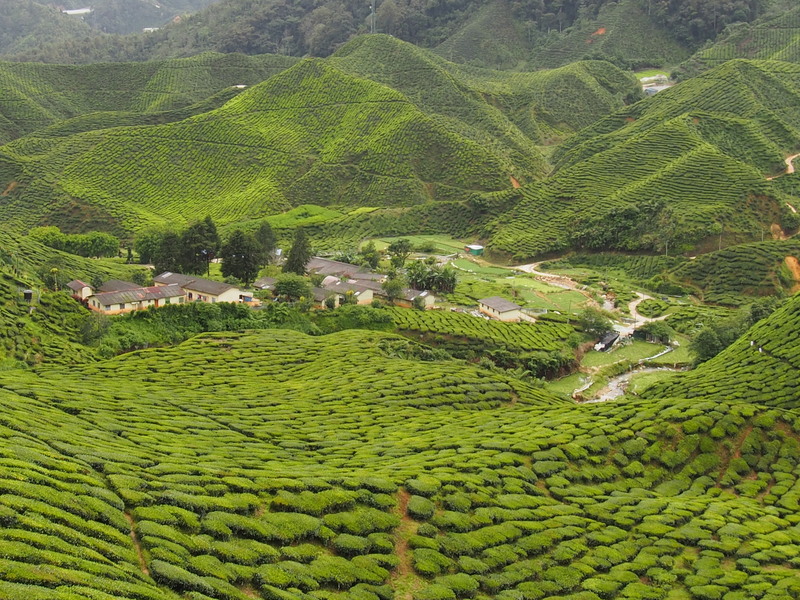 The Cameron Highlands consist of thick jungle and tea plantations (see top picture) named after the Scottish surveyor who first mapped the area. We stayed in an old-fashioned resort hotel outside the town of Tanah Rata which had something of a Grand Budapest Hotel feel, but was lovely. We had the first of our ‘compulsory gala dinners’ here – slightly surreal with lots of Asian carols and invitations to church services, Father Christmas doing the rounds, etc (there’s really no escape). But it was very entertaining. And extremely tasty. On Christmas Day another guide picked us up for what I had not realised was a ‘challenging’ jungle trek up Mount Brinchang. 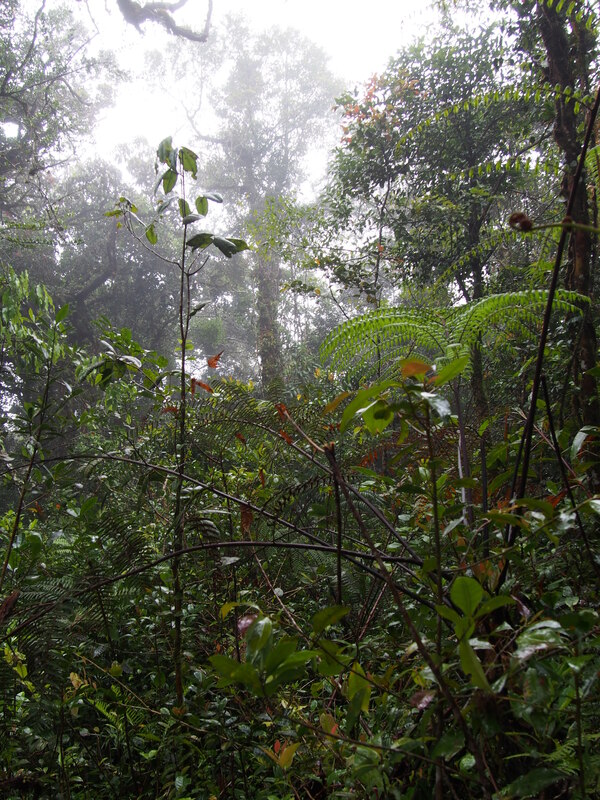 For the first twenty minutes or so I was in a state of panic and could hardly breathe – we had two hours of almost vertical clambering through thick jungle vegetation using rocks and tree roots as hand- and footholds. We all had the unforgettable sensation of finding ourselves up to the ankle in squelchy tropical sludge. I got cuts and bruises on my legs and my left thumb hasn’t been the same since but once we got into the rhythm it is was surprisingly exhilarating as well as beautiful. Unlike the rest of my family I’m no physical endurance type and it was the toughest thing I’ve done. I felt triumphant to have made it to the top, from where we were driven down and just as well, because my quads were in agony for the next two days! A new driver/guide (like everyone we met, they were all wonderful and we learned as much from chatting with them as from the official tours) fetched us for another long drive out of the Highlands to the island of Penang, joined to the mainland by the longest bridge in SE Asia (24km). 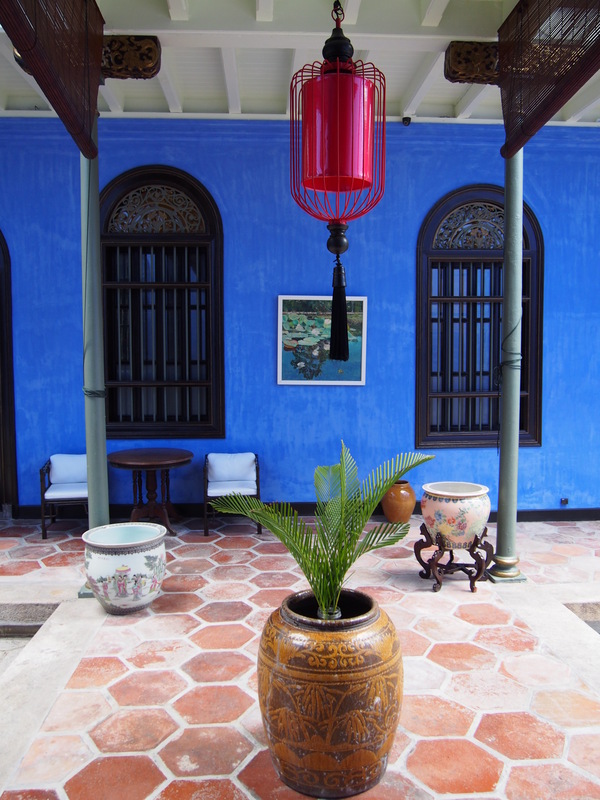 George Town, Penang, was our favourite city of the trip with lots of gracefully decaying colonial architecture and some of it, such as the Blue Mansion, beautifully restored. 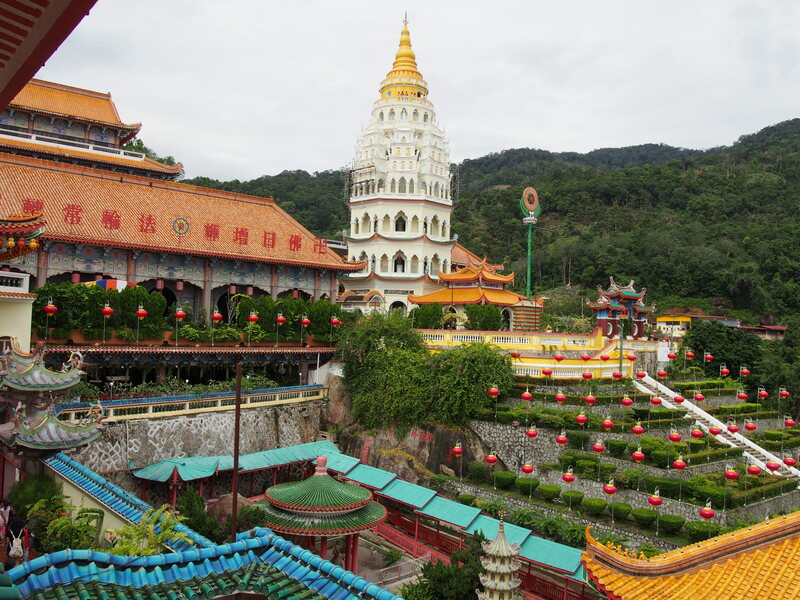 We visited Buddhist and Hindu temples in all the towns but went into overdrive here, culminating in the extraordinary and huge hilltop complex of Kek Lok Si. Unmissable without a doubt but we were completely templed out by the end of it. 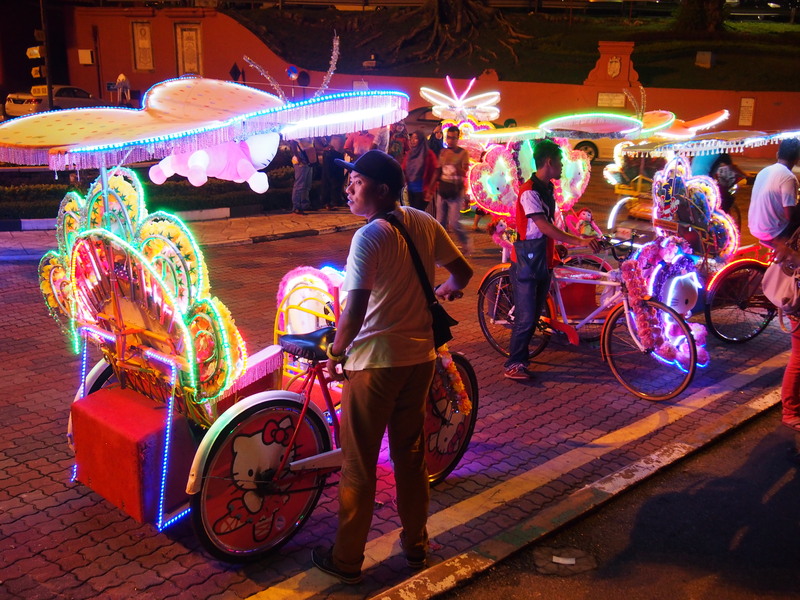 We went to the Red Garden Night Market, a typically Malaysian dining experience where you visit the different stalls (there are dozens) and food is delivered to your table. I realise it sounds like we did little but eat but as Malaysia is an Islamic state and alcohol’s expensive, at least we didn’t drink very much. 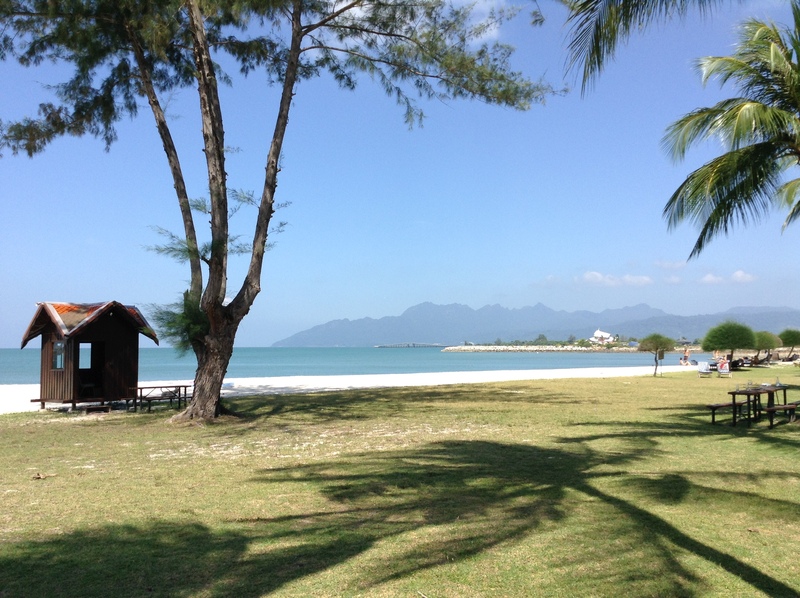 The weather was a bit brighter and drier in Penang but when it came to the final leg on the beach island of Langkawi we really needed the sun and were delighted to get it for three days straight. This was quite a hectic trip, a riot of colours, sights and sensations and although we are notoriously bad at relaxing and doing nothing, somehow we managed. The setting of the resort in Pantai Cenang is stunning although we preferred the huge swimming pools to the sea – the kids enjoyed the cultural stuff but they loved being able to go off and do their own thing for hours on end. The hotel put on a fabulously over the top new year’s eve beach banquet and the entertainment featured one of the best saxophonists we’d ever heard, but for the highlight for me – seriously – was my 16-year-old son coming up on stage to dance with me (along with hundreds of other guests)! It was an amazing trip and it felt like we were gone for about a month. 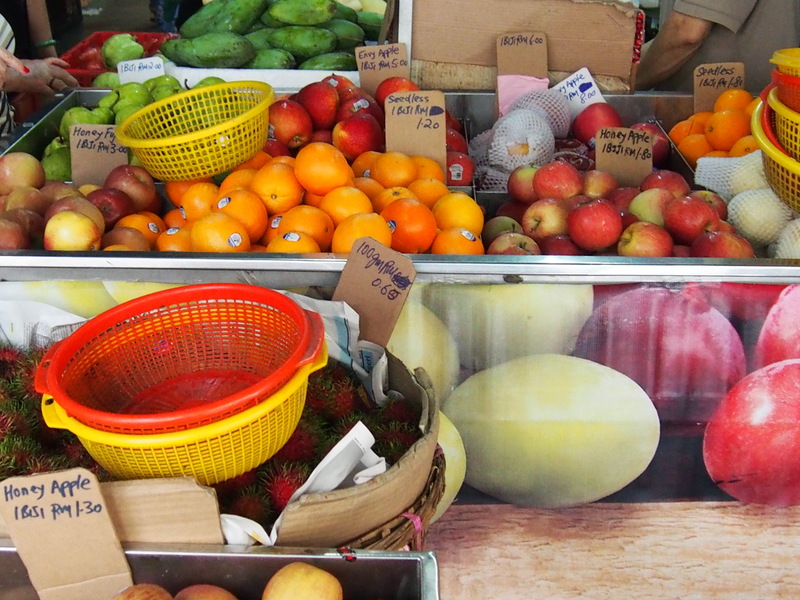 We’re still keen to see Vietnam one day and hopefully more of Asia in due course. A very happy 2015 to all my readers – I hope you’ll visit the Literary Sofa often for talk of books, trips and writing. Got any travel plans? *During the trip I loved reading two superb novels whilst staying in the places they’re set: The Separation by Dinah Jeffries (partly set in Melaka during the Malayan Emergency of the 1950s) and Tan Twan Eng’s first novel, The Gift of Rain, set in Penang around the Japanese occupation of WW2. My first guest of 2015 will be joining me here on 15 January – It’s Philip Teir, AKA #Scanzen, author of THE WINTER WAR, which is one of my Hot Picks 2015. Well, at the other end of the tropical scale, I went to visit the Brontë Parsonage museum in Haworth with exotic Tour de France slogans still painted on the roads there over the wily, windy moors! From a literary inspiration point-of-view your trip looks wonderful — have you been inspired to write anything set there? I read somewhere that novels set in South-East Asia are particularly popular (perhaps it’s because of the sense of exotic warmth that you capture so well). One of my ex-coursemates from City University set her novel there and it’s very atmospheric. Great photos and sounds like you had an amazing trip! Sounds wonderful – I appreciate that the highlight of New Year’s Eve was your 16 year old son dancing with you on stage – Us mothers of sons cherish moments like that! This brings back so many memories far holiday about 20 years ago but which I still recall for all the colours and tastes. The Cameron highlights were a delight after the muggy conditions of KL but how bizarre to find thatched roof tea rooms and hotel as if we were in Stratford on Avon. Lovely, evocative novel set in Southeast Asia – The Art of Hearing Heartbeats by Jan-Phillip Sendker. Loved it and bought several copies for friends. Wonderfully descriptive post. It just so happens that my mother and sister are in Malaysia at the moment, so it’s great to get an insight into what they’re experiencing. They’ve sent pictures through the wonders of WhatsApp, but for me, pictures just aren’t the same as words. These photos made me feel homesick: I am truly happy you had a lovely time! What lush settings for great writing.